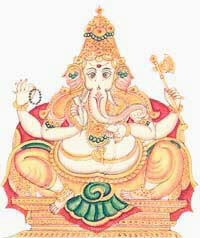 Ekadanta Ganapati is one among the 32 forms of Ganesha. This form of Ganesh is believed to bless students and help them in concentrating in their efforts. Ekadanta means one with a single tusk. Ekadanta Ganapati is blue colored and has four hands. The hands hold axe, Rudraksha, sweet and the broken tusk. A symbolism attached with Ekadanta Ganapati states that those who work hard will be blessed with sweet by this form of Ganesha – meaning they will be successful in their endeavor. This form of Ganesha is worshipped for attaining inner strength and to overcome lust. Meditating on this form helps in attaining peace.